Mr. Terry James Eason was born August 23, 1963 in Glennville, GA to his parents the late Mr. Eugene D. Eason and Mrs. Mary Linda Eason. Terry attended the public school system of Tattnall County, GA and graduated from high school in 1981 from Glennville High in Glennville, GA. 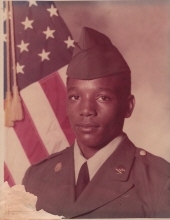 He enlisted in the United States Army and served from 1981-1984. While serving his country he received several accolades to include: Army Service Ribbon, Overseas Service Ribbon, Army Achievement Ribbon, Sharp Shooter’s Badge and Good Conduct Medal. After his military service, he returned home to Glennville and began working in the Logging Industry until his health began to fail. Terry was joined in matrimony to Linda Eason of Forrest Park, GA in earlier years. To this union two children were born. In March 2004 Terry married Jessie Hill Eason. Terry had one son, Terrance Eason to precede him in death. Terry leaves to cherish his memories his loving and devoted wife, Jessie Eason of Glennville, GA, his mother Mary Linda Eason of Glennville, GA; three children-Brandi Eason of Forrest Park, GA, Samantha Overton(Anthony) and Tony Hill, both of Glennville, GA; four sisters-Lorna J. King of Glennville, GA, Felicia Jones of Phenix City, AL, Judy Jones of Augusta, GA and Sharleta Calhoun (Mal) of Statesboro, GA; four brothers-Theron Eason(Mattie) of Houston, TX, Bernard Eason(Mary), Larry Eason(Linda) both of Glennville, GA and Nicholas Eason of Statesboro, GA; eight aunts and a host of grands, great grands, cousins and other friends. Two special friend: Sylvester Sharpe and Harry Conner and a special “sister” Edginee Eason. To send flowers or a remembrance gift to the family of Terry James Eason, please visit our Tribute Store. "Email Address" would like to share the life celebration of Terry James Eason. Click on the "link" to go to share a favorite memory or leave a condolence message for the family.